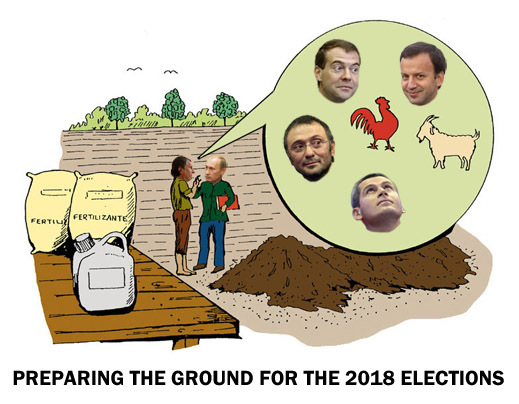 MAKING POTASH SAFE FOR DEMOCRACY — AFTER SULEIMAN KERIMOV’S EXIT, WHO’S NEXT? How many angels can dance on the point of a pin was a trick question for medieval scholars: that’s because, theologically speaking, angels have no substance. So the correct answer is that an infinity of them can sit on the point. Alternatively, since Thomas Aquinas (d. March 7, 1274) claimed two angels cannot occupy the same space, the answer is only one angel. Fill a modern room on the bank of Lake Valdai last week with a couple of hundred academicians and reporters, most of them from states bent on regime change in Russia, and the headline question they want to debate is: will President Vladimir Putin (standing figure centre) run for re-election in 2018? Everyone, even the French present, appeared to miss one of the points Putin was making. 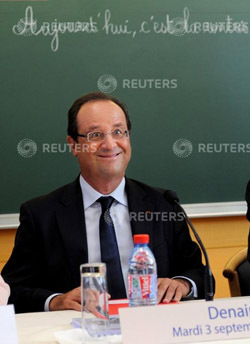 He was attacking the incumbent President of France Francois Hollande publicly, and not for the first time. This time round it was Fillon’s turn, — earlier it was Gerard Depardieu’s and Dominique Strauss-Kahn’s — to play foil to a warning of how badly Russia’s relationship with France has been damaged by Hollande. Fillon’s presidential campaign is no news in France. It started last month. By giving the French presidential campaign prominence in Novgorod on Thursday, Putin was once again inviting French voters to put an end to the incumbent; and, incidentally, to invite the right wing in France not to repeat its mistake with Nicolas Sarkozy. But Putin’s reference to the five years left before he announces his presidential intention is another point the academic audience in front of him also missed. Five years is a long time in politics, Peskov wanted to emphasize. It’s also a short time, Putin was warning. That warning has been made crystal clear to Prime Minister Dmitry Medvedev (bubble top left) and his deputy Arkady Dvorkovich (top right), by another of Putin’s men. It’s a warning against trying to assemble the half-billion dollar campaign fund necessary to run; and against recruiting the oligarchs whom Medvedev and Dvorkovich count on to pressure (pay) Putin into retirement. 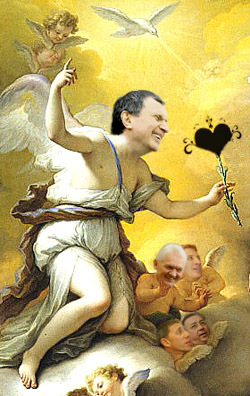 The angel of this negative annunciation is Igor Sechin (right), formerly first deputy prime minister, then chief executive of Rosneft, and potentially the prime ministerial replacement if Medvedev and Dvorkovich continue plotting the regime change which they failed to achieve between 2010 and 2012. For years now Sechin has been attacking Gazprom’s power to serve Medvedev’s ambitions by curtailing the cashflow from its monopoly over Russian gas exports. He is now within weeks of his biggest success. The federal Energy Ministry has now finalized changes to this provision; they will allow exports by competing Russian gas producers, starting with Novatek, controlled by Sechin allies Gennady Timchenko and Leonid Mikhelson, as well as Sechin’s own Rosneft to obtain their own licences for shipment of liquefied natural gas (LNG). This is a precondition for Novatek to finance the multi-billion dollar expenditure required for its Yamal LNG project and the Sabetta port terminal on the Karsk Sea. The new measure is likely to clear the State Duma and Federation Council by the close of December. It will include a provision for extra government supervision to prevent the gas producers undercutting each other’s export prices. Alexei Miller, the chief executive of Gazprom for the past twelve years, has survived by bowing under Sechin’s pressure. Ziyavudin Magomedov (bubble, bottom) has resisted — and is surviving less assuredly. His takeover of the two leading oil ports, Novorossiysk and Primorsk, three years ago has run into the concerted opposition from Sechin’s allies, Nikolai Tokarev at Transneft, Vladimir Yakunin at Russian Railways, and Timchenko at the rival Baltic port of Ust-Luga. Together, they are denying Magomedov his ambition to create the energy trading and transportation empire he has been aiming at. Medvedev and Dvorkovich have been too weak to save him, or even to conserve his capital. The share price of the Novorossiysk Commercial Seaport Company is now trading at 40% less than Magomedov’s takeover price. Magomedov’s appeals to Gazprom to protect him from Sechin aren’t being endorsed by Miller. The commercial details vary in each of these complex stories. The political meaning is constant, and simple. Suleiman Kerimov (bubble, left), the Senator from Dagestan, evidently failed to notice when he attempted his potash putsch. In Dagestan, the interpretation is that misfortune has befallen the two native sons, Magomedov and Kerimov, because they have been on the wrong side of the conflict between the Kremlin and Magomedsalam Magomedov, the Dagestan President, until he was replaced in January by Ramazan Abdulatipov. “Dagestan was fed, but not taken care of,” Abdulatipov told Putin at a Kremlin interview in August, “and therefore a lot of bad cells have multiplied.” “The cases of Kerimov and [Ziyavudin] Magomedov are connected with the replacement of the Dagestan elite,” according to a source who believes both of them are among the “bad cells” Abdulatipov is now eliminating. A source close to Sechin believes the stakes are more national than local. He is predicting that other oligarch-sized figures with businesses dependent on Medvedev and Dvorkovich must choose to withdraw and realign themselves, or else suffer the same fate. The fertilizer and coal businesses of Andrei Melnichenko – Eurochem and SUEK – are vulnerable, according to this calculation. So too are Yandex, the search engine and internet portal, and Ilim Pulp. Since he became prime minister, Medvedev has allowed himself to meet one on one and in public with no major Russian business figures. The two exceptions are Andrei Volozh, the control shareholder of Yandex (below left); and Zakhar Smushkin, the control shareholder (with Boris and Mikhail Zingarevich) of Ilim Pulp (right). For the political risks facing Yandex, read this. NOTE: Ziyavudin Magomedov turns out to be the only member of the Valdai Club’s board of trustees who wishes to publicize the appointment. When Sergei Karaganov, the Club’s chairman, was asked to identify the other trustees, he refused, claiming the list is on the Valdai Club website. When informed the list cannot be found there, he hung up his telephone.